The international students, who are citizens of the EU Member-States, shall bring with them the European Health Insurance Card (EHIC), which gives them the right to access to medical assistance in any EU country. International students from other countries must have a private health insurance. This insurance will give them access to the Portuguese private medical practice services with which the insurance company has an agreement. In some cases, within the framework of specific agreements between Portugal and other countries, the citizens of those countries may benefit from the use of specific medical assistance certificates, which they have to request to the competent authorities in their home countries, before departure to Portugal. After arrival, to benefit from public medical assistance, students have to register in the health centre ("centro de saúde") of their area of residence in Coimbra. The EHIC or the specific medical assistance certificates, the residence permit issued by the Foreign Office (for stays longer than one year) and the identification document are needed for the registration. After registering, students staying longer than one year receive a health service user number (“número de utente”), which gives them access to the medical services of the Portuguese National Health Service (SNS), under the same conditions as the Portuguese citizens in Portugal. For instance, they will pay the same amounts, legally in force, for the provided health services. Students with private health insurance documents have to proceed in the same way, but they will be subject to the payment of amounts different than the ones applied to students covered by the SNS, according to the law in force. Therefore, it is very important that students obtain the HEIC or the specific medical assistance certificates, when applicable to their home country, before travelling to Portugal. 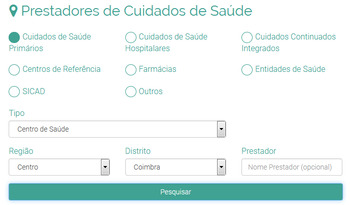 To find out which is the nearest health centre of your area of residence, search the web portal of the Ministry of Health of Portugal. The health centre is the first contact for health problems that do not require urgent medical treatment. Alternatively, especially during weekends, you can contact the Saude24 health line by dialling 808 24 24 24. In case of medical emergency, call 112 or go to the University Hospitals ("Hospitais da Universidade de Coimbra"), Praceta Prof. Mota Pinto, 3000-075 Coimbra. All registered students can benefit from medical assistance at the Medical Services of the University of Coimbra located in Campus I. All students with their enrolment and registration up-to-date are beneficiairies of the UC school insurance, which covers accidents during the academic activities on campus or abroad, as long as they've been authorized by the university. For further details, check this page.